In 12-inch nonstick skillet, add hot water and sauce mix (from Hamburger Helper™ box); stir to combine. Stir in milk, uncooked pasta (from Hamburger Helper™ box) and pepper flakes. Heat to boiling, stirring occasionally. Reduce heat; cover and simmer 6 minutes, stirring occasionally. 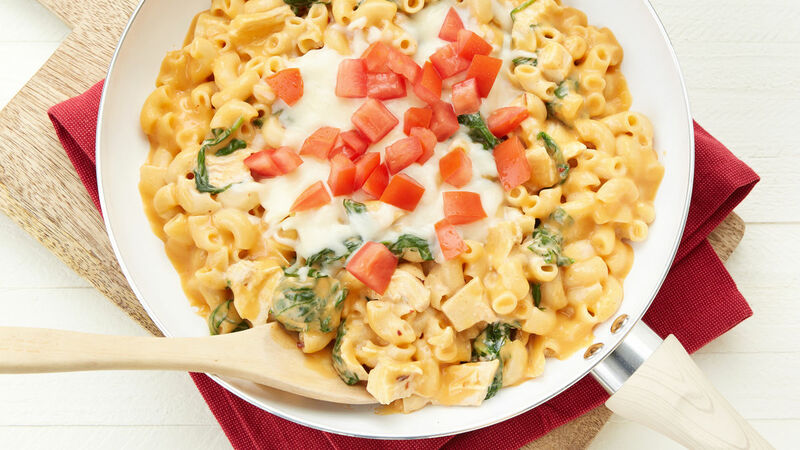 Stir in turkey and spinach; cover and simmer 5 to 6 minutes or until pasta is tender. Remove from heat. Stir in sour cream; top with cheese. Cover and let stand about 5 minutes or until cheese is melted. To add a fresh element, top with chopped fresh tomato. Change up the flavour by using Monterey Jack cheese in place of the mozzarella cheese.